On Sunday 21st October 2018, the Muriel Bolton Award for 2018 was presented to Geraldine Wynne of Wicklow LTC. 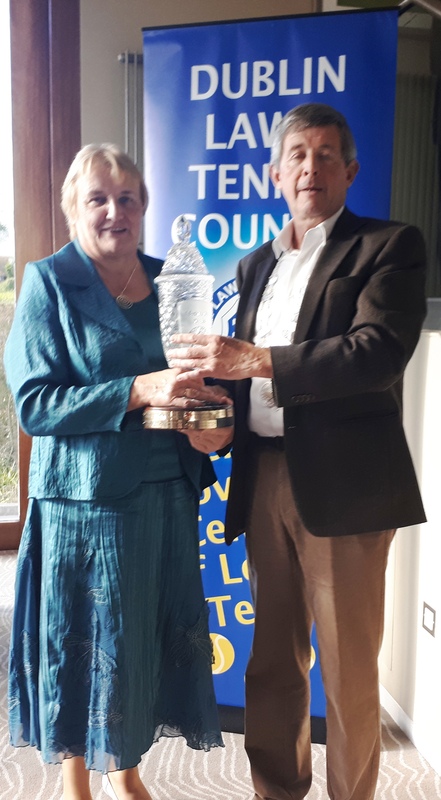 This Award is made annually to a Lady member of any club affiliated to the Dublin Lawn Tennis Council who in the opinion of the Council has made a significant contribution as a player or administrator to the Dublin Leagues. This award recognises the long contribution of the late Muriel Bolton to the promotion and running of the Dublin Leagues over a period of more than 40 years. Geraldine Wynne has been a member of Wicklow since 1975, and has been a Committee member from 1978 to 2001. During this time, she held many different roles. She served as Secretary and Vice President, and as Club Captain in 1990, Geraldine was instrumental in Wicklow LTC joining the Dublin Lawn Tennis Council Leagues. Geraldine is a very keen and talented tennis player. She won her first Wicklow Club Championship Singles title in 1976 and for the next 23 years, she defended her title….an astonishing record of 24 unbroken years. As a veteran, Geraldine has Irish Open Singles and Doubles titles. She has represented Ireland since 1996 in World Team Championships. She continues to represent Ireland in the 4 Nations championships. Geraldine Wynne is indeed a very worthy recipient of the Muriel Bolton award for 2018. The photograph shows Geraldine receiving her award from Harry McCarthy, President of the Dublin Lawn Tennis Council.